Highly effective warning light. MicroPulse Wide Angle lights can be programmed to operate as a single unit or in synchronization with multiple MicroPulse light heads. 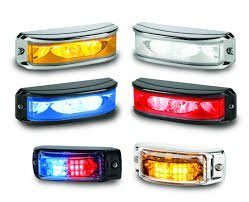 Built-in flash patterns enable multiple vehicle perimeter lights to be either synchronized in the same pattern or in opposite sequence. Built to last. The MicroPulse Wide Angle lens is made of UV resistant polycarbonate to protect against harsh conditions. Models come standard with a Black bezel and are also available with an optional Chrome bezel.